The availability of mobile device ecologies enables new types of ad-hoc co-located decision-making and sensemak-ing practices in which people find, collect, discuss, and share information. However, little is known about what kind of device configurations are suitable for these types of tasks. 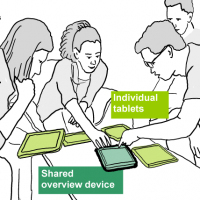 This paper contributes new insights into how people use configurations of devices for one representative example task: collaborative co-located trip-planning. 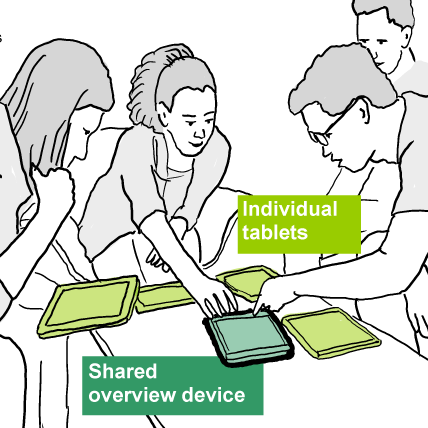 We present an empirical study that explores and compares three strategies to use multiple devices: no-overview, overview on own device, and a separate overview device. The results show that the overview facilitated decision- and sensemaking during a collaborative trip-planning task by aiding groups to iterate their itinerary, organize locations and timings efficiently, and discover new insights. Groups shared and discussed more opinions, resulting in more democratic decision-making. Groups provided with a separate overview device engaged more frequently and spent more time in closely-coupled collaboration.